Tidy your home, Upgrade your life! Here is a “before” look at the storage unit. 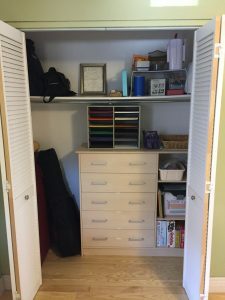 A unique aspect of the KonMari Method involves moving furniture used for storage into your closet. With a few exceptions, storage furniture is not beautiful or necessary (in the way a chair is necessary for sitting or a bed for sleeping), but it simply serves the practical purpose of being a holding place for stuff. During this Tidy Upgrade of the Komono category, we discarded and sorted homeschooling and office supplies. Many paperclips were thanked for their service during this process. 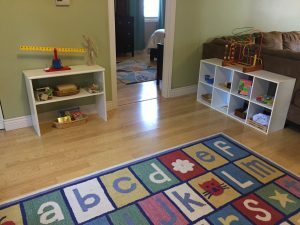 The metal shelving in the closet was discarded to make way for the storage unit, leaving space in the great room for a cute Montessori-inspired preschool area. Rather than piling items on the floor of your closet (or purchasing expensive closet storage solutions), Marie Kondo recommends moving your storage units into your closet. That’s exactly what we did here. It was a perfect fit! 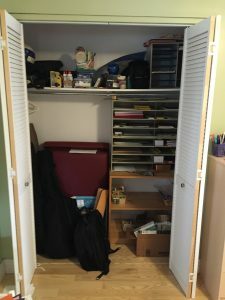 I removed the door of the cabinet so the items would be easily accessible (and the cabinet door wouldn’t open in the closet). I also stacked the games vertically so that they would not be be piled on top of each other in an unsteady horizontal tower. After: Neat and Tidy Closet. The storage unit has been moved into the closet. 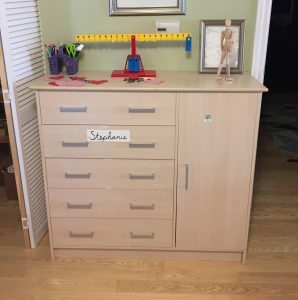 Each child has their very own drawer for storing their works-in-progress or special toys. School supplies like markers, pencils, and glue are contained neatly in the top two drawers. Notice the vertical storage of games in the bottom right. Here is the Montessori preschool space next to the closet. Spark joy! I Kondoed My Hair, and I Couldn’t Believe What Happened! You should check out our services!